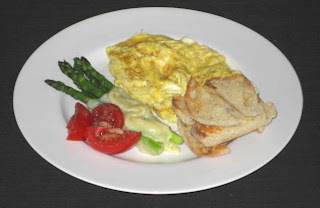 This morning when I opened fridge door and saw some asparagus, Swiss cheese and eggs I saw a breakfast. So simple and utterly delicious. I just peeled bottom half of asparagus stem, nuked it in wet paper towel for 1 minute and then wrapped in 3 thin slices of Swiss cheese and broiled in toaster oven till cheese melted. While this was going on I scrambled 2 eggs plus 2 egg whites that I had leftover from other meal, toasted and sliced English muffins, plated it (on preheated plate as usual, of course) garnished with a sliced tomato and bingo! Breakfast done in about 5 minutes. Next time I’ll wrap the asparagus in cheese and then slice of ham. My first choice would be prosciutto but no prosciutto for sale in our town. I never thought of Dijon, thanks for great tip. This version had extra 2 egg whites and they made it very light, almost like a Soufflé. I just love blue cheese but they are so bloody expensive!